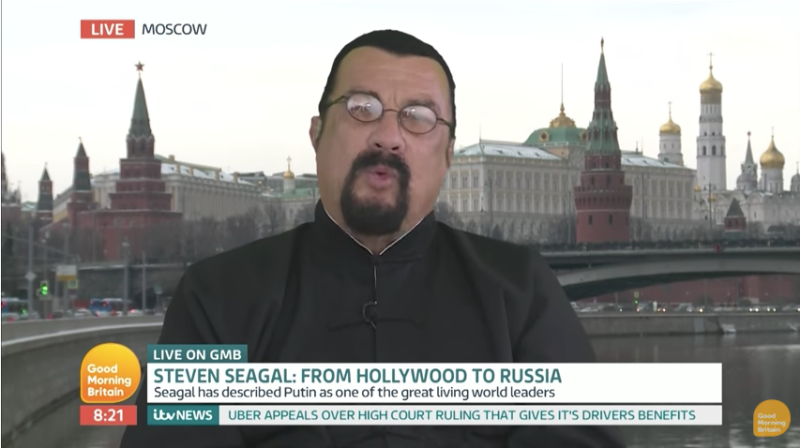 Apparently smarting after his interview with Piers Morgan was ridiculed far and wide for, among other things, obtusely arguing against NFL player protests and enthusiastically praising Vladimir Putin, lawman and blues guitarist Steven Seagal licked his wounds by writing a book, such that he could better explain his political ideas. It is written in the only language Seagal knows: that of a low-rent, straight-to-DVD action flick, its dual nature upheld by each side of the colon in its title The Way Of The Shadow Wolves: The Deep State And The Hijacking Of America. The foreword is by Sheriff Joe Arpaio, because of course it is. The book follows John Nan Tan Gode, an Arizona Tribal police officer, described on the first page of the book as having “classic chiseled features,” who stumbles upon a conspiracy that reaches the highest levels of power. It is, in other words, a written adaptation of a Steven Seagal movie by Steven Seagal himself, a casting suggested most prominently by its cover, in which the legendary lawman saunters brow-a-furrowed out of some sort of wolf sunset. Shadow Wolves is a book of fiction based on reality. Both author’s (sic) have worked with, confronted, and seen the power of the Deep State and the manner in which many federal government agencies willfully violate the Constitution and the laws of the land in service to special interests. The 2016 election has for the first time made many American citizens aware that the Deep State is very real; that the mainstream media is a fake news media offering a false narrative designed by the secret intelligence world in service to special interests. Still, perhaps we should give The Way Of The Shadow Wolves: The Deep State And The Hijacking Of America (with a foreword by Sheriff Joe Arpaio!) its fair shake. After all, as Seagal’s author bio notes, he “is an actor, producer, screen writer, director, martial artist, sheriff, musician and international businessman.” He also has experience with groping 16-year-old girls, falsely claiming to have worked with the CIA, fending off sexual-harassment lawsuits, uh delivering roundhouse kicks or whatever, and turning into a wolf, if the cover of his debut novel is to be believed. Why would we doubt his ability to write a kickass novel that proves the existence of a vast international conspiracy of pedophiles or something? It is available for $2.99, or free if you have Amazon Prime. Act now.